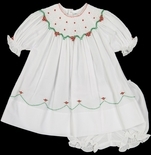 Girl's Smocked Dresses, Smocked Clothing and Outfits are Lovely, Sweet and Classically Traditional. Dress your baby and little girl in precious, traditional smocked clothes for a darling look that never goes out of fashion. These hand smocked and embroidered dresses, outfits and gowns are perfect for holidays, portraits, special occasions, Christening or everyday wear. Our smocked dresses and outfits for girls feature colorful designs just right for young ladies and soon to be young ladies! The hand smocking is done individually by beautiful artists around the world. You will be impressed with the attention to detail from the wonderful clothier brands we carry. Smocked Dress in Lime and Cranberry Paisley by Maria Elena. Feltman Brothers Dress for Baby Girl in White with Pink Flowers. Petit Ami Girl's Smocked Blue Dress And Bloomers. 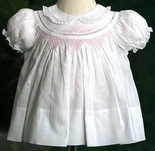 Baby Girl's Smocked White Day Gown With Pink Green Embroidery by Maria Elena. Baby Girl's Smocked White Day Gown With Pink Bow By Maria Elena. Baby Girl's Smocked White Day Gown, Pink Rosebuds By Maria Elena. Girl's Smocked Day Gown In White And Pink By Maria Elena. Girl's Smocked Birthday Cake and Presents Pink Birthday Dress by Rosalina. 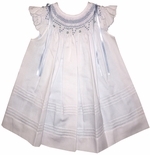 Will'Beth Smocked Dress for Girls in White with White Satin Ribbons.